Former deputy defense minister Manvel Grigoryan, who was promoted as "national hero of Armenia, participated in a numerous war crimes such as the Khojaly genocide, looting of property of Azerbaijani residents during the occupation of Fuzuli and Jabrayil regions of Azerbaijan, torture and mass murder of prisoners of war, as well as taking hostage of civilians, their torture and murder, Spokesman for Azerbaijan’s Foreign Ministry Hikmat Hajiyev told Trend on June 18. He was commenting on the recent arrest of the former deputy defense minister of Armenia Manvel Grigoryan. “In his interview in 2014 with the Armenian bureau of Radio Free Europe/Radio Liberty, Grigoryan openly and “proudly” stated that he returned from the Karabakh war with hundreds of Azerbaijani hostages and forced them to work in his house,” Hajiyev said. 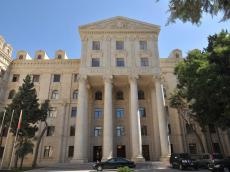 The spokesman added that Grigoryan, accused in this regard of violating the Geneva Conventions, contemptuously stated that he does not recognize the Geneva Conventions and is proud to be an Armenian. “Unfortunately, the criminal case initiated against Grigoryan is limited only to economic crimes committed in Armenia. The crimes committed by him during the war, especially actions against hundreds of Azerbaijanis, whom Grigoryan, by his own admission, captured and took hostage, must be investigated,” Hajiyev stressed. The spokesman expressed hope that international organizations for the protection of human rights, including the Council of Europe, will be active in this issue.